Composite decking is produced to mimic the look of wood in color and texture without the maintenance challenges wood presents. In recent years, composite has become popular with homeowners because it requires little or no maintenance, looks fantastic for decades and can be expected to perform well for a long time. Just how long it will last isn’t yet known. Composite decking hasn’t been around long enough to reveal its lifespan. While composite decking prices are higher than some of the most affordable decking materials, its benefits make it a good value in the long term. Composite decking is made from a blend of equal parts wood fiber and plastic. The materials are mixed with colorants, preservatives and UV inhibitors to prevent fading. The mixture is heated, and the boards are extruded. A texture is cut or pressed into some composite materials while cooling. The result is a durable material that requires little maintenance. 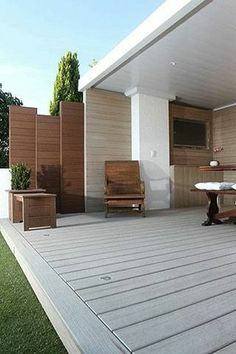 Most composite decking manufacturers produce good, better and best lines to reach a broader range of consumers. For the environmentally conscious homeowner, much of the wood and plastic used in today’s composite decking is recycled from pre- and post-consumer materials. The largest manufacturer, Trex, uses more than 7 million pounds of recycled plastic every year. Most of it is recycled plastic jugs and shopping bags. Composite deck boards are available in several dimensions, though most are about 1” thick and 5.5” to 12” wide. Boards with nominal dimensions of 1”x6” are the vast majority. 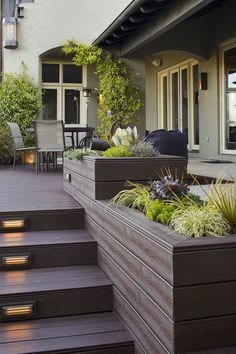 Since the decking costs more initially than cedar or PT lumber, it might not be a cost-effective choice if you plan to move in the next 3-5 years. However, since you’re not having to rent or buy a power washer, use expensive cleaners and stain and/or seal it every two years, composite is a better long-term value than those materials. 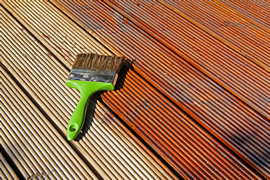 If you plan to stain your composite deck, it is advised that you wait three to four months to allow the initial fading to occur. The stain will penetrate better at that point. Premium composite decking is typically finished with a plastic coating that enhances its durability and resistance to fading. Veranda ArmorGuard, for example, is called “capped composite” which is a term for being coated. Trex Transcend, Trex Select and TimberTech Earthwoods are similar product lines. How Much Does it Cost to Build a Deck Using Composite? 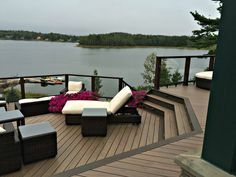 Did you know that most decks finished with composite decking start with a pressure treated frame? This reduces costs. Here are composite deck prices when stairs, rails, posts, spindles and accessories are factored into the estimate. 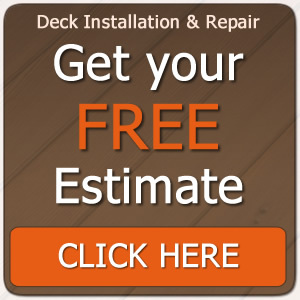 Deck repair costs more than building a new deck because boards need to be removed before being replaced, and there might be structural repairs required too. These are the leaders in the composite decking industry. There’s very little maintenance required with composite decks. These composite decking care tips will prolong the good looks of your deck. This brief composite decking Q&A covers common questions. I had a composite deck built in 1998, and it looked bad within a decade. Is the new composite better? 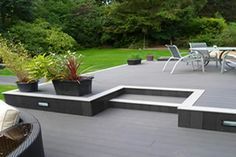 New generation composite decking is coated (capped or wrapped in industry terms) to resist scratching and fading, and the UV fading inhibitors are better. The appearance of most products has improved too, with more color and texture options. Do holes have to be pre-drilled in composite? No, not in most composite products. 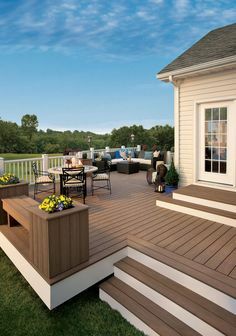 What fasteners are used with composite decking? Deck screws of various lengths are used as the primary fastener. Glue can be used as a secondary fastener. Since composite is made from recycled material, why does it cost more than cedar or PT lumber? The recycled materials must be processed for use in decking first. Then, pigments are added, and the mixture is heated and extruded. The manufacturing process is more complex than in wood decking production. You’ll receive written estimates from three pre-screened deck installation companies where you live, and they know they’re competing for the work. It’s an excellent way to find the right combination of experienced and affordable composite deck installation.